The current frenzy over global warming has galvanized the public and cost taxpayers billions of dollars in federal expenditures for climate research. It has spawned Hollywood blockbusters and inspired major political movements. It has given a higher calling to celebrities and built a lucrative industry for scores of eager scientists. In short, ending climate change has become a national crusade. And yet, despite this dominant and sprawling campaign, the facts behind global warming remain as confounding as ever. 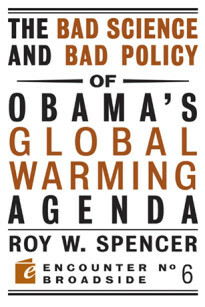 In Climate Confusion, distinguished climatologist Dr. Roy Spencer observes that our obsession with global warming has only clouded the issue. Forsaking blindingly technical statistics and doomsday scenarios, Dr. Spencer explains in simple terms how the climate system really works, why man’s role in global warming is more myth than science, and how the global warming hype has corrupted Washington and the scientific community. The reasons, Spencer explains, are numerous: biases in governmental funding of scientific research, our misconceptions about science and basic economics, even our religious beliefs and worldviews. From Al Gore to Leonardo DiCaprio, the climate change industry has given a platform to leading figures from all walks of life, as pandering politicians, demagogues and biased scientists forge a self-interested movement whose proposed policy initiatives could ultimately devastate the economies of those developing countries they purport to aid. Climate Confusion is a much needed wake up call for all of us on planet earth. Dr. Spencer’s clear-eyed approach, combined with his sharp wit and intellect, brings transparency and levity to the issue of global warming, as he takes on wrong-headed attitudes and misguided beliefs that have led to our state of panic. Climate Confusion lifts the shroud of mystery that has hovered here for far too long and offers an end to this frenzy of misinformation in our lives. Roy Spencer is a principal research scientist for the University of Alabama in Huntsville. In the past, he served as Senior Scientist for Climate Studies at NASA’s Marshall Space Flight Center in Huntsville, Alabama. Dr. Spencer is the recipient of NASA’s Medal for Exceptional Scientific Achievement. He is principally known for his satellite-based temperature monitoring work, for which he was awarded the American Meteorological Society’s Special Award. He Lives in Huntsville, Alabama. Climate change was political long before Al Gore first started talking about it. In the 1970s, the Swedish Social Democrats used global warming to get political support for building a string of nuclear power stations. It was the second phase of their war on coal, which began with the acid rain scare and the first big UN environment conference in Stockholm in 1969. The Great Global Warming Blunder unveils new evidence from major scientific findings that explode the conventional wisdom on climate change and reshape the global warming debate as we know it.